Strength (R) says activate and experience the specific emotions derived from your “core” beliefs – good or bad, right or wrong – ride these emotions, allow them to flow freely and you will be led to the beliefs behind them. Accept the validity of your feelings, while realizing that they are about certain “core” beliefs which are not necessarily factual statements of your reality. Do not be inflexible – your personal integrity and strong will power come from valuing your feelings. Your inner sense of balance comes from the innate knowledge of your unity with nature. Do not lose your nerve or surrender – there must be harmony to succeed. If you really believe that you are right – then be firm, but never cause distress to others. Face your reality and it will clarify any disturbing influences. Obstacles can never be overcome if you lack moral or spiritual strength and you will not progress unless you fully understand this. Stop engaging in this mental state of “self – doubt”. Do what comes naturally to you. Be self aware, uncensored – act spontaneously – KNOW yourself. Feeling a need to be strong can prevent us accepting from others when it is their turn to give. Everyone must take as well as give. What inner passions need to be expressed and reconciled? In the first position: Your personal karma may be very much devoted to the kamic needs of your group. In the second position: Neither be too patronizing nor aloof in working with people. You can be direct and honest and still be considerate. Work to be part of the solution, not part of the problem. In the third position: Group karmas are asserting themselves. In the fourth position: It can be difficult discerning which relationships and situations are most deserving of your attention. Without the ability to prioritize and say no when appropriate we become drained by participating in the wrong shows. In the fifth p0sition – You may be either too immersed in these questions, or not enough. In the sixth position: Caution against complacency. Must marshal forces to an even greater extent. This may be a testing of loyalties, of yours, of others. In the seventh position: You may fear your own strength in what you are considering, or of course your weakness. In the eighth position: Too much strength might deter others or you from some opportunities. Too little, for the purposes you may have under consideration. 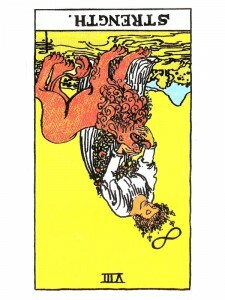 In the ninth position: The heart is not at its strongest; you may have put too much energy out, not gotten enough energy back. In the tenth position: This strength is to enable you to help others, perhaps your group more than yourself.